Please excuse the clumsy paraphrasing of a Jimmy Buffet lyric in the title. This is NOT a prospect article. It is the promised review of a new restaurant. 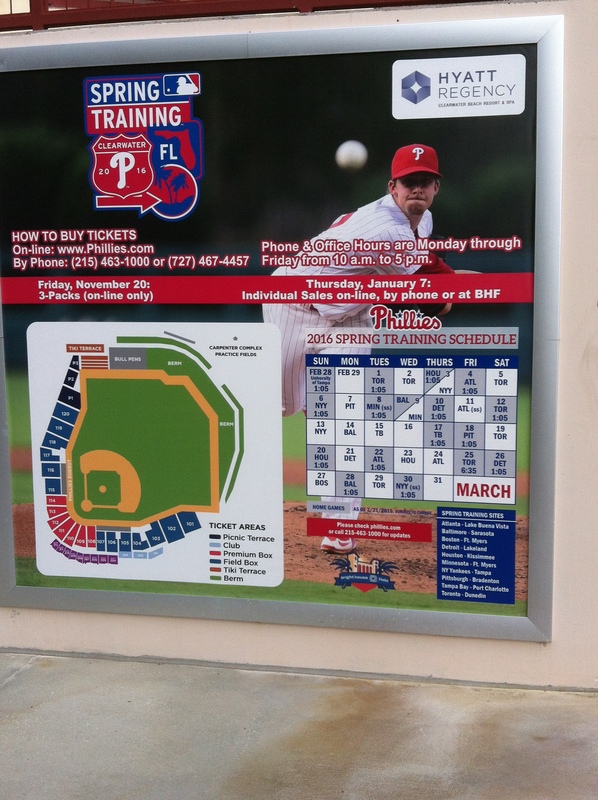 It is specifically targeted toward readers who travel to Clearwater for Phillies’ Spring Training and Grapefruit League games and those who live in the Clearwater area. After the Phillies left Clearwater last spring, the Tilted Kilt closed two of their area locations. The Kilt on Drew Street across from Bright House Field was one of the two. 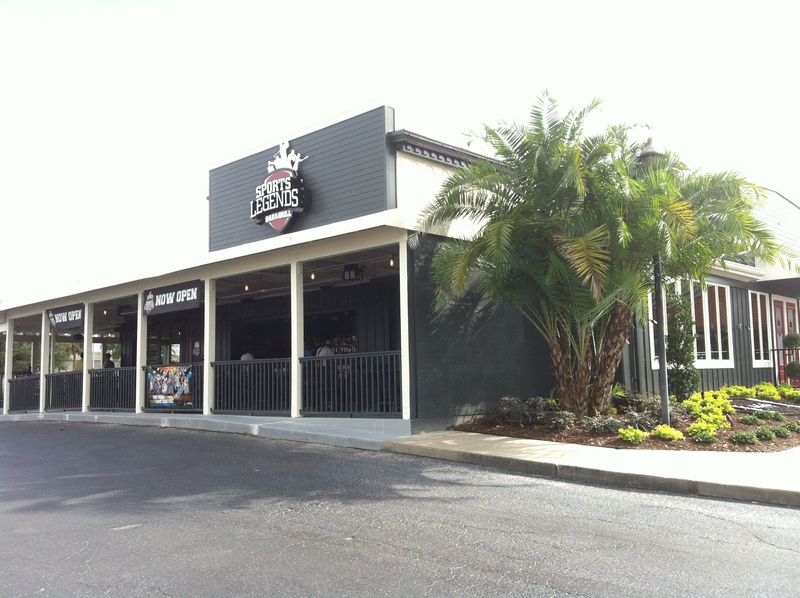 As early as mid-April, the location was being renovated to reopen as Jimmy’s Sports Legends Bar and Grille. Recently, they had their much awaited “soft opening” on November 20th as Sports Legends Bar and Grill. Their web page is still under construction. It announces their upcoming Grand Opening, a coupon offer, and that they are hiring. They have an active Facebook page. The establishment is under the same management, but underwent a complete renovation of the interior and exterior. Gone is the former rustic interior. It has been replaced with booths and a much brighter ambiance. Also gone are the the clever limericks that were on the ceiling beams. We opted for bar service and sat at the new bar. Our bartenders were Larry and Tia. Larry had the distinctive sound of a displaced Philadelphian. The 15-year Florida resident, is originally from Kensington. He was very helpful, providing suggestions regarding the menu and answers to the few other questions we had. Now, down here, there are very few places to get a decent cheese steak. Delco’s on Main in Dunedin comes closest to a real cheese steak. You probably have had one at Bright House. Well, Sports Legends’ cheese steak has vaulted to the top of my list of sandwiches in the Clearwater area. Remember you have to ask for the Whiz. 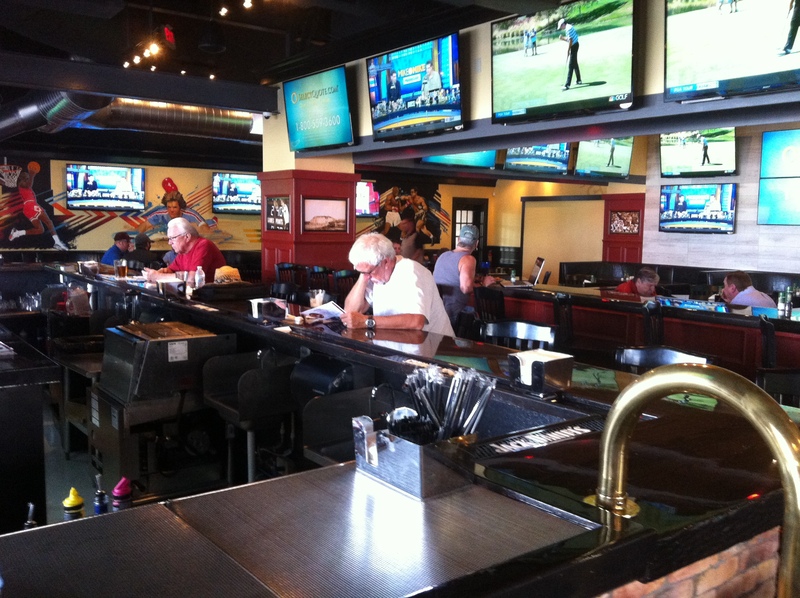 The menu is standard sports bar fare. A couple of interesting additions are the green Bay Brat, the New Orleans Shrimp Po Boy, and a Sausage and Peppers Sub. Some of the sandwiches are served on an Amoroso’s roll, like the cheese steak and the sausage sub. Our sandwich came with fries. We opted to upgrade to very good onion rings for a dollar surcharge. Most of the sandwiches are in the $10.99 range. They have wings with 9 different heat intensities. 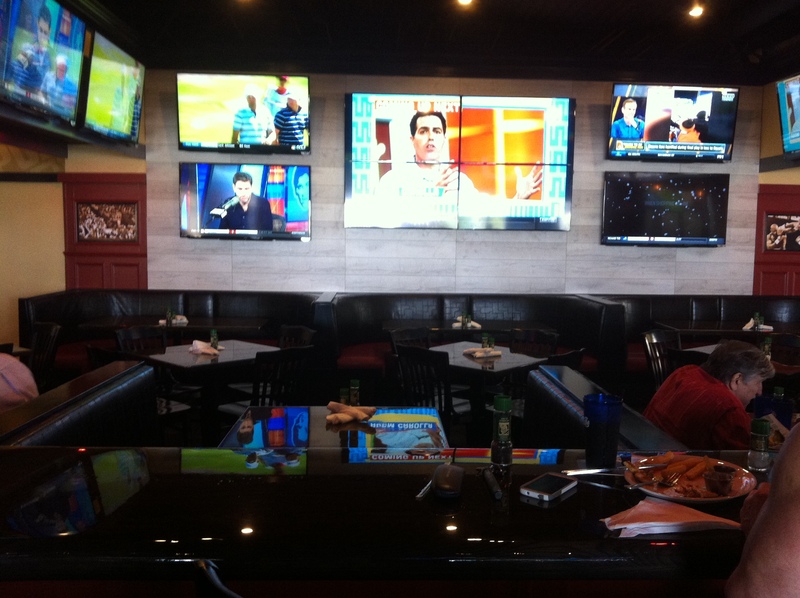 Like any self-respecting sports bar, the interior includes dozens of flat screen TVs. Tables along the walls have been replaced with booths. Tavern tables have been added in the bar area replacing the video games that used to be there. You can still sit at the bar while on the deck. And the long counter between the bar and restaurant has been updated. The current menu is available for download from their website, but Larry told us that a new menu is being drafted and is being finalized. This updated menu will be introduced at the Grand Opening on December 16th. Daily specials and happy hour prices and duration should be established by then. Here are two shots of the exterior. 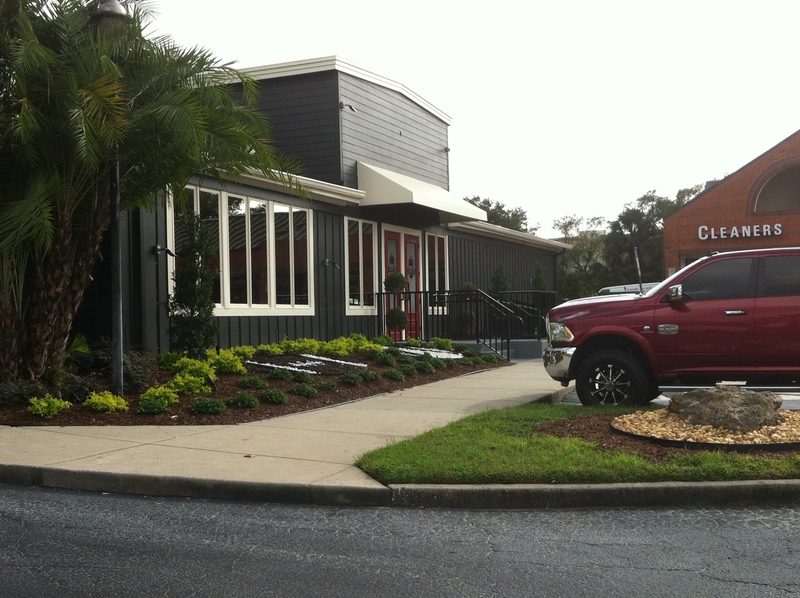 The picture on the left is the deck on the Drew Street side of the restaurant. The other is of the main entrance. The hostess station is the same as before, but the restaurant’s main dining area is very different. Notice the booths on the left and right. The bar and the new tavern tables. The tables replaced a golf video game and one of those basketball shooting games. They helped block the windows and added to the old dark interior. That’s my friend Dave in the red shirt. Pete Rose is resting his chin on his head. Part of the back dining area. That’s Pete Rose sliding into the waitresses’ head. And the main restaurant area from the bar. The surface in the foreground is the replacement for the former wooden divider between the areas. 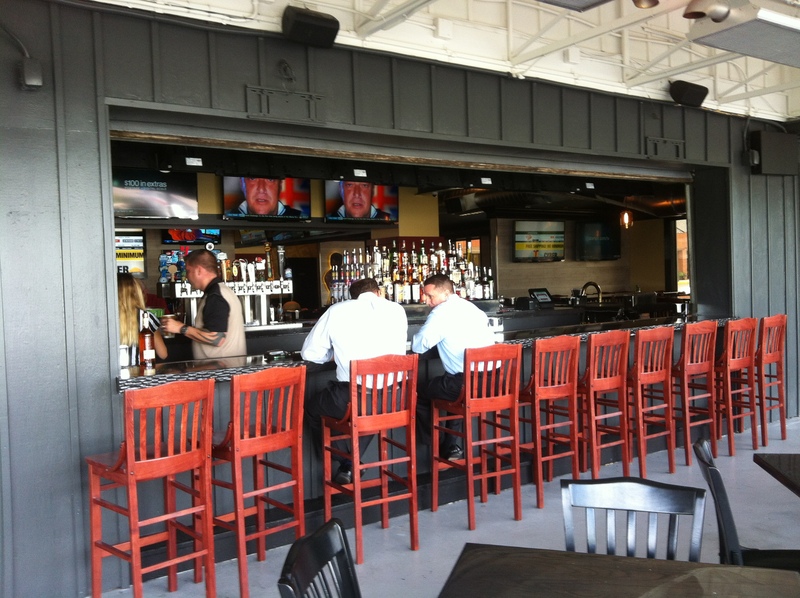 The deck bar on the Drew Street side. I enjoyed the cheese steak so much, I’m going back tomorrow with my wife. Afterward, we stopped at the gift shop at Bright House. The picture below is an indication that we are getting closer to BASEBALL! It’s the sign posted at the bottom of the steps at the West Gate. 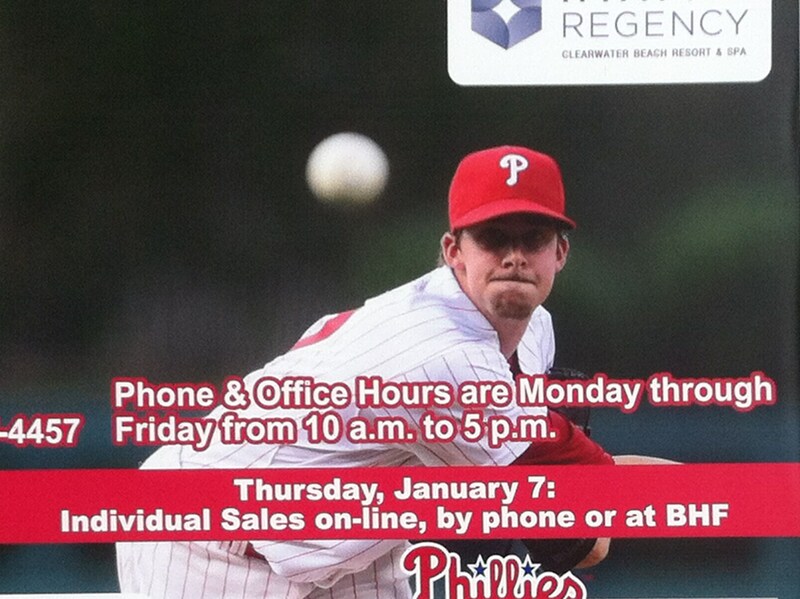 And finally, a reminder that we are experiencing a changing of the guard – the new face of the Phillies!? Aaron Nola. Hope you enjoyed this puff piece. I’m having surgery this weekend. I’ve created next week’s open discussion and have updated it daily so that it will be somewhat current when it posts. I’m setting it up to post automatically. I haven’t tried this before, hope it works. Good luck Jim, Hope all is well. My nephew went to school in the Midwest and from the stories he told me you are 100% right about the cheese steak made from a ribeye steak on a roll. He said sometimes the steak was a quarter to half inch thick. One place they served it on a Kaiser roll. I moved to the Tampa area from Phill ‘burbs about 4 months ago and have been looking for a good cheese steak. I’ll check it out the next time I am in Clearwater. Thanks for the tip. Hope all goes well Jim!!!! Thanks for the post. Are you coming down again this spring? Yes I am planning on it Jim, and recommendations? A few if you stay up by 19. The Brown Boxer at Enterprise and 19 has happy hour on most domestic drafts (mostly light beers and of course Yuengling) for $1.75 from opening to closing except for a 3 hour period from 7-10 PM on weekdays. Lunch, dinner, and drink specials vary from day to day. Owned by Philly family. Also have a Clearwater Beach location and one in Madeira Beach. We’ve had too many bad experiences at Lenny’s for me to recommend it, but we found a Cracker Barrel in Tampa (just past Oldsmar, about 25 minutes from BHF) that is far enough away from the stadium and hotels to not have long waits and is close enough to make the drive worthwhile. I love the option of eating breakfast for dinner. Shepherd’s Waterfront Restaurant offers a dinner buffet and Sunday brunch buffet. It’s right on the water in Clearwater Beach. Brunch included unlimited mimosas and free valet parking. Wide variety of choices. Check website for pricing. Dinner at sunset was nice. I’m not embarrassed to take advantage of an early bird special like the one at Cody’s – reduced on select meals until 7:00 PM, 2-4-1 on most drinks in the restaurant until 7:00 PM, all night at the bar, but you get both drinks at the same time. If you order a draft beer, take it in the 32 oz mug rather than in 2 pint glasses. A server explained to me what I already suspected – the mug provides an extra 1.5 oz of beer. probably due to a lower head-to-surface ration. Specials at Red Lobster and Olive Garden dictate when we go to those restaurants. Retired, fixed income, you know. Great, I will definitely check some of these out. Hey, if you know of any good places to stay towards the entrance of clear water close to 60 that is not a spring breaker hangout let me know. As you know I call on a bunch of accounts in the Tampa area (not much industry in Clearwater 😉 while down there so I don’t want to stay to far into Clearwater or along the gulf. We’re down in Cape Coral where several shops claim to offer genuine Philly cheese steaks. At last one does, starting by a young couple whose family owned pizza shops in Northeast Philly and the Jersey Shore. They have Amoroso rolls and home made cheese whiz. Don’t try ordering a cheese steak in Virginia, either, I’ve learned from experience. Frank, I have family in Cape Coral, and am down a few times a year. Where is the new steak place? 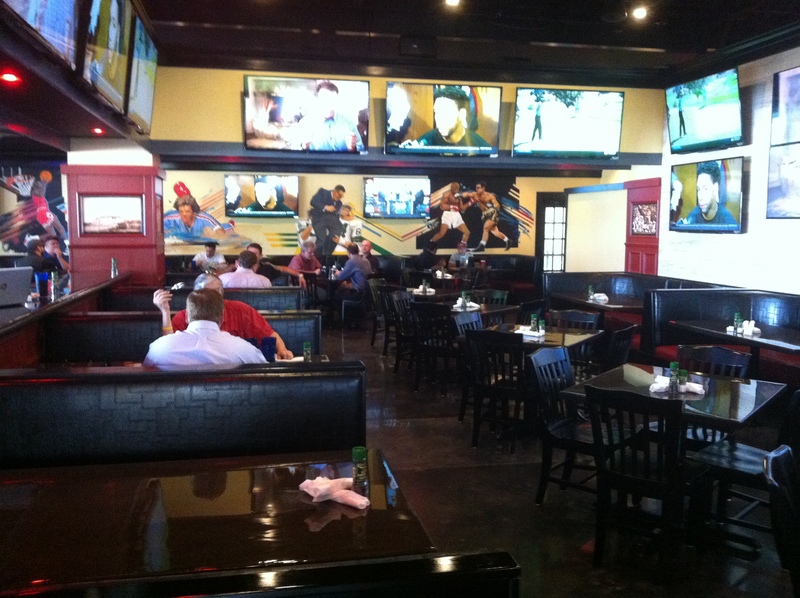 108 Cape Coral Parkway, Overtime Pizza, which, despite its name, is a huge sports bar and restaurant with an extensive menu. Kristina is the young Mrs. who is often the hostess. Really charming young couple. They’re very excited to have their own place after working in family shops in Philly and South Jersey. Sorry for the typo. It’s 1708 Cape Coral Parkway. moving to FL. Still get the cheesesteak rolls from PA. Still boggles my mind why a bread company in Florida cannot produce a roll with the same quality and texture as in the Philly area. You figure Bay or Tampa Bay Breads or Pane Rustica, could easily do it and make a killing. Who knows , even the New Yawkers would like it. Didja know that the Florida Wawas receive dough from Amorosos and bake their rolls on site? Jim and rocco….did not know that about the WaWas….though one of their execs here in DELCO did tell me that going south in VA, NC, SC and Georgia were not successful ventures on their part, but the Florida connection with people from Philly area down there was a good investment and I guess they want to keep those taste buds from Philly alive in the Sunshine state.So import the thing that would do that. I guess that could be a reason, not sure what the chemical breakdown is different from the northeast to Florida. Perhaps the high water level down there makes a difference, who knows? I think there is a place in Southern CA where they have Amorosos rolls flown in daily. Not sure but I think they call themselves “Everything Philly”. Yes jim even here in philly they bake on site. Funny part is of all the great hoagie shops Here in philly.,as a vegetarian I enjoy wawa veggie hoagies the most. Very interesting. We just had Wawa stores open in Cape Coral-Fort Myers and it was a BIG event. My niece’s job is to help open new Wawa’s. My personal connection is having known Elise du Pont when she was First Lady in Delaware and I was a young news reporter covering state government. Her family, the Woods, own Wawa. Other than that, my connection is buying coffee and pumping gas. Romus as a guy who has been to florida a lot. I have come to realize its the water. I hate the bread down there. Years ago when I started to go to florida. I would take eastern airlines early flight. They used to fly down bread to a market in launderdale. That was the only place I knew to get good bread. I Even at one time was thinking of buying a refrigerated truck and setting up a route to florida with bread from philly. That was always my complaint down there. Going to dinner and getting lousy bread. But I would have given up the bread to move there, but my wife hates it. so most of my many trips were with friends. Tomatoes, too. Just not nearly as red, juicy and delicious as those from South Jersey and Delaware. good luck with the surgery !!!!!!!! get well soon, we need you back on here !!!!! Thanks Jm, the place sounds good. I’ll check it out in March for sure. I’ll miss the cleavage (and tatoos) though. Delco’s are decent. The best cheesesteak I’ve found in Tampa is at a 2-store chain, both in North Tampa, called Philly Phlava. One is off Fletcher and Dale Mabry, the second is off Tampa and Sheldon roads. Bob – funny I was going to comment on my experience at Philly Phlava. It was adjacent to a Five Guys I used to visit from time to time. In any event, while I had by far the most authentic (as the Tampa area goes) Philly cheesesteak at this establishment , the grease factor rendered it inedible. Bun was falling apart by the third bite. Just need to set things straight. Whiz is for tourist and suburban kids. True Philadelphian’s know and will tell you that American and Provolone came (1930’s) first and Whiz was added years later (1950’s) to speed up the orders. Whiz is a joke. The only thing it is good for is some cliche shot of a guy slapping it on when coming back come commercial on MNF. Your minor league coverage is great but you lose credibility when you prefer Whiz over American and Provolone. Readers: Order the cheesesteak but you DO NOT have to ask for Whiz. In fact, you shouldn’t. American and provolone will do just fine.